He is considered to be the father of English clock making, and designed watches and clocks throughout the late 1600s. Early ownership of a Tompion clock or watch was limited to Monarchs, Princes, aristocracy and wealthy merchants. His customers included King Charles II and Cosimo III, Grand Duke of Tuscany. During Thomas Tompions career he created 5,500 watches and 650 clocks, making him England’s most prominent watchmaker. Tompions success was attributed to the sound design of his work and the high quality of the materials he used. Thomas Tompion was born around 1639 and was baptised July 25, 1639 in Northill, Bedfordshire, England. He probably worked as a blacksmith until 1664 after which he was apprenticed to a London clockmaker. His early clock-making style demonstrates his connection with Jospeh Knibb, who introduced Tompion to his first important patron, the scientist Robert Hooke. Who’s patronage would prove to be Tompions route to success. Hooke opened up the world of modern clock making technology and Tompion became the first ever watch maker to use a balance spring. The first watches he made with balance springs were much more accurate than earlier watches. He joined in 1671 and became a master in 1704. He was also one of the few watchmakers to become a member of the Royal Society. In 1680 Thomas Tompion became a member of the Royal Society, one of the only clock-makers ever to do so. 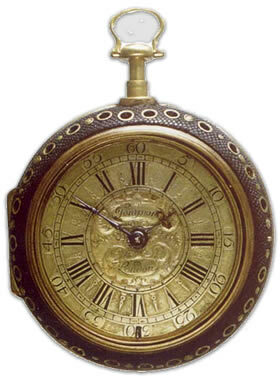 King Charles II selected Tompion for the creation of two clocks based on Robert Hooke’s idea of a very long pendulum. Both clocks only required winding once a year and proved to be so accurate they were key in defining precise calculations for astronomical observation. He also invented the cylinder escapement that allowed him to create flat watches. He also worked on the spring escapement. Another of his innovations was creating a numbering system for his spring and long-case clocks, which is thought to be the first time that a serial numbering system was applied to manufactured goods. Which is why Thomas Tompion clocks are known for their ingenuity, design and robust construction. And why his three-train grand sonnerie bracket clocks are considered masterpieces. In 1701, Tompion briefly joined in partnership with Edward Banger. In 1711 Tompion joined in partnership with George Graham, who developed the spring escapement further after Tompion’s death. Graham also continued Tompion’s scheme to number his watches in three series: plain, repeating and special. Thomas Tompion died on November 20, 1713 and is buried in Westminster Abbey. Many of his clocks are still in operation today including two of his one-year clocks which are on display in Buckingham Palace.